Former Hanjin workers pre-register with the SBMA Labor Department for a jobs fair on February 8 at the Subic Bay Freeport Zone. 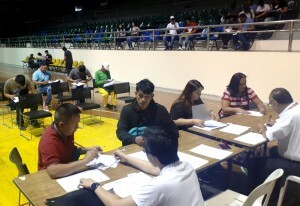 SUBIC BAY FREEPORT — The “Build Build Build” team composed of various government agencies will gather around 70 employers from different contractors involved in the government’s infrastructure program, and companies within the Subic Bay Freeport Zone for a Jobs Caravan on February 9, Saturday. Wilma Eisma, chairperson and administrator of the Subic Bay Metropolitan Authority (SBMA), said the Authority is committed to find jobs for the displaced Hanjin workers. 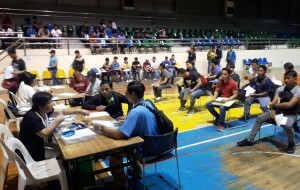 “Tuloy po ang paghandog ng oportunidad, at paggaling ng abilidad, para lahat ay umunlad,” Lopez said.